242.pilots (HC Gilje from Norway, Lukasz Lysakowski from Poland, and Kurt Ralske from the United States) became well known as live cinema artists early on in the 2000s, releasing a DVD entitled 242.Pilots: Live in Bruxelles in 2002. Their shows and DVD feature members of the group performing individually and as an ensemble. 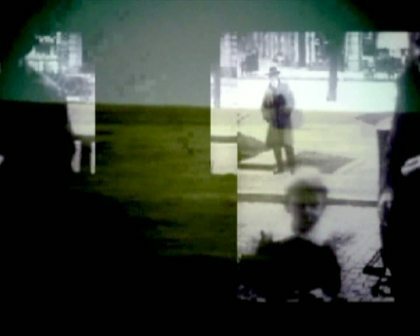 242.pilots’ ensemble work, as seen in the excerpt, consists of multiple layers of superimposed projected video. The videos move back and forth between abstract and representational imagery, often using blurring and distortion to cause the subjects of the live action portions to dissolve into abstraction. Video images are often fractured, reassembled, and juxtaposed so as to create multilayered collages. The resulting textures are at the center of the work, rather than the individual source videos. HC Gilje, “Within the Space of an Instant,” HC Gilje website, September 19, 2005, http://www.bek.no/~hc/texts.htm. Jean Poole, “242.Pilots Interview,” Skynoise website, 2003, http://www.skynoise.net/2008/07/31/242pilots-interview/.